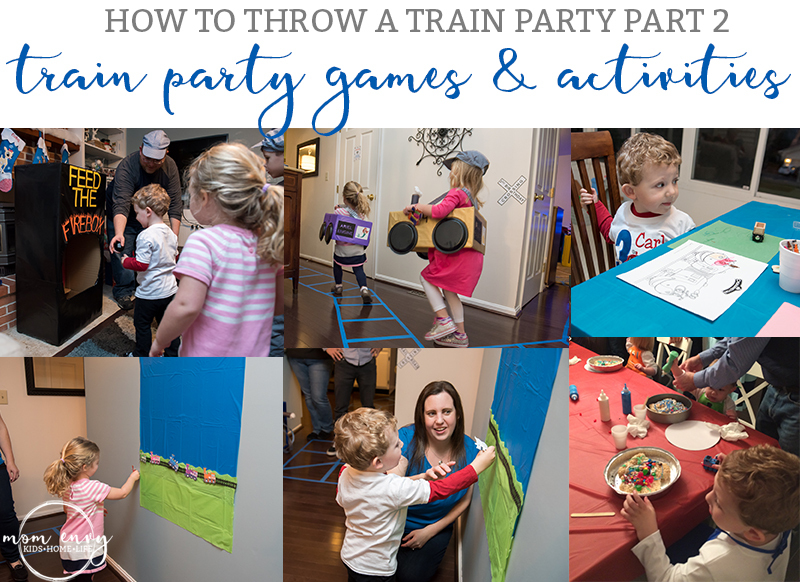 Alright, fellow parents of train-obsessed children, our focus today will be on train party games and activities. If you missed Part 1 of Throwing the Ultimate Train party, click here. 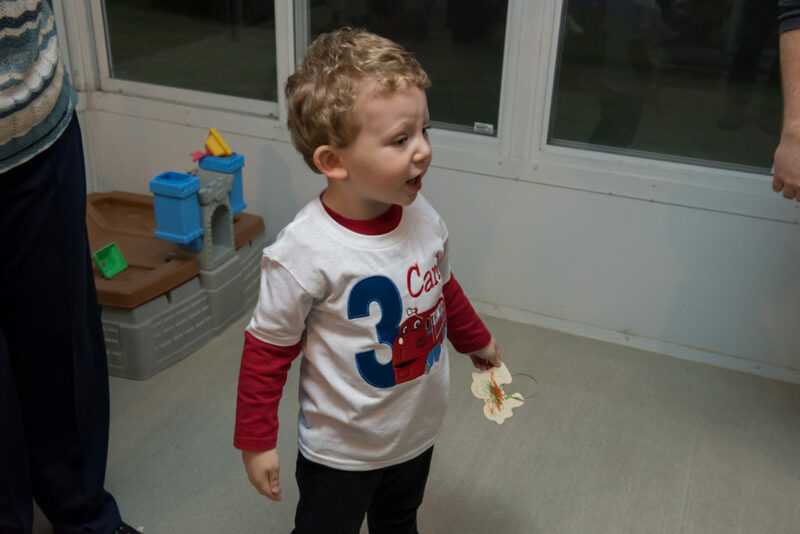 As you look at the games and activities we had, keep in mind our parties were for when Carl was 3 and 4. We had guests ranging from babies through eight years old. Due to the wide range in ages, we decided to focus on activities that could be enjoyed by all of the party-goers. My son’s birthday is in December so we used Christmas time to our advantage. In addition, I tried to come up with activities that would be interesting even to those children that aren’t train-lovers. Starting around 3 or 4, it’s children can really participate in structured activities and games. I prefer to give the kids a little bit of free time and the rest is all structured time. 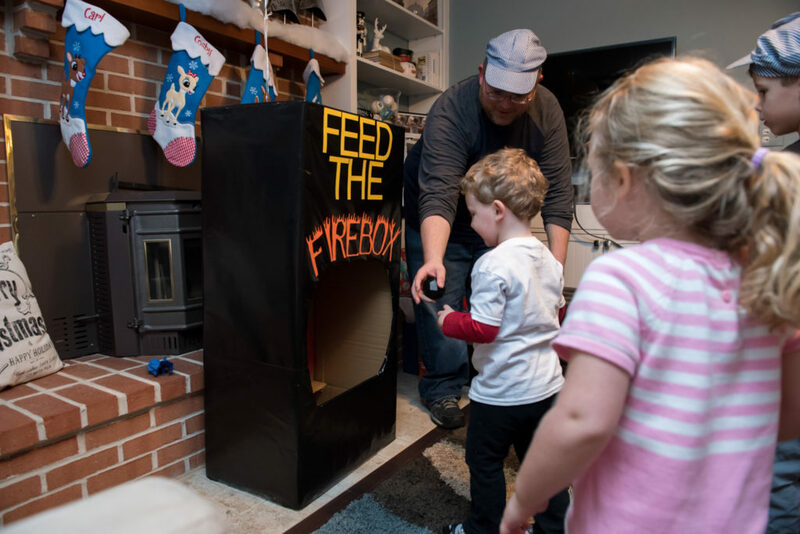 In my personal experience, too much free time can result in some arguments over sharing and kids getting bored or, tearing apart our playroom. 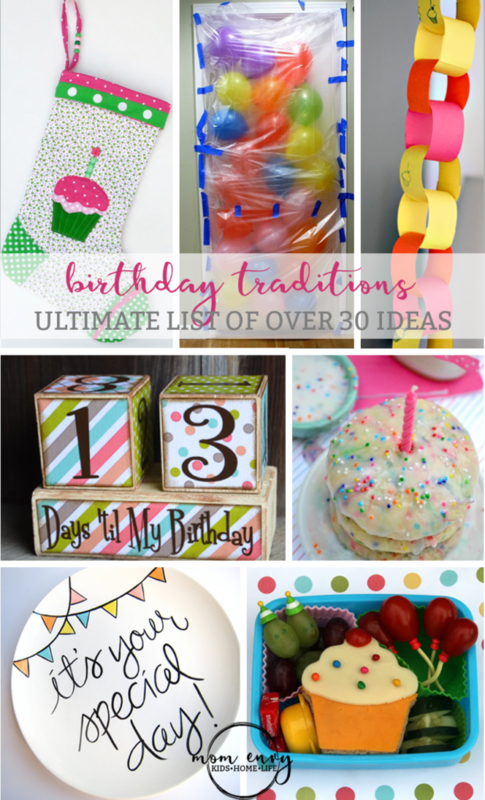 By keeping the kids engaged with various activities and games, the time goes by quick. The kids also truly enjoy the structure as long as the activities are age appropriate and of interest to the majority if not all of the group. 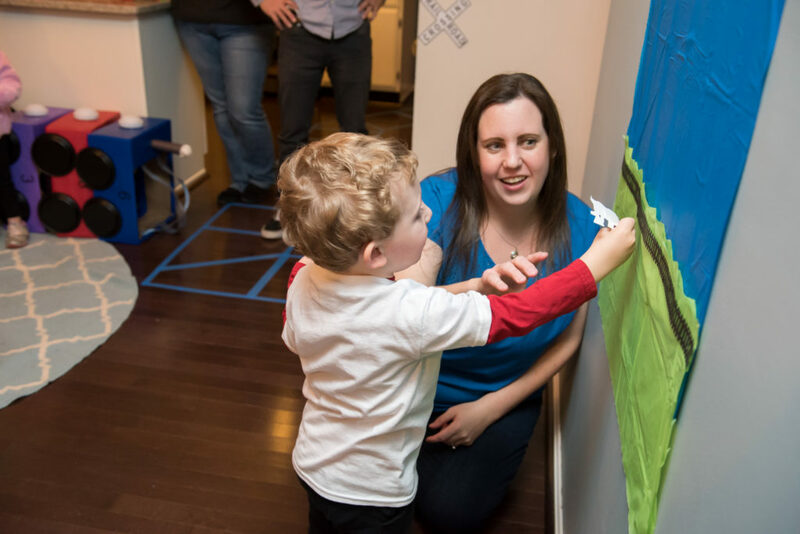 It’s also important to provide different types of activities so that all kids can feel included (think – drawing, physical/movement activities, etc). 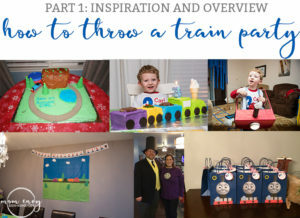 The games/activities we did at his third birthday are: painting train ornament, painting train car, coloring pages, Coal in the Hole, tracks around the house, cardboard trains, and pin the train on the track. 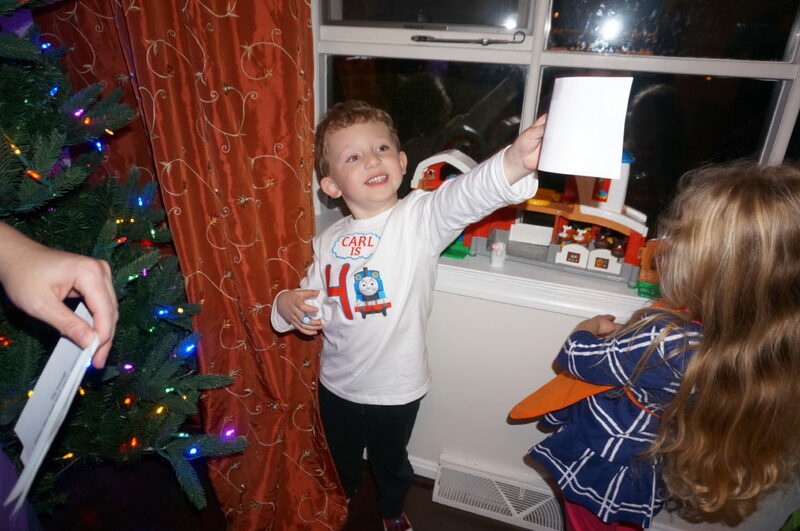 The games/activities we did at his fourth birthday are: tracks around the house, train apron, decorating rice krispies train, coal in the tinder car, conductor says, coloring pages, and treasure hunt. 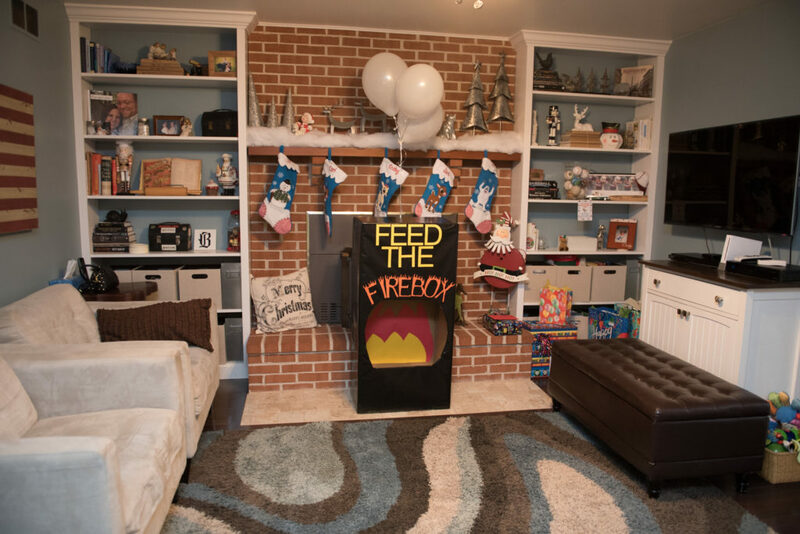 This was a must-have for our party both year. It has a large impact without having to spend a lot of money. I bought two rolls of blue painter’s tape – a thinner roll and a thicker roll and used some sidewalk chalk we already had. 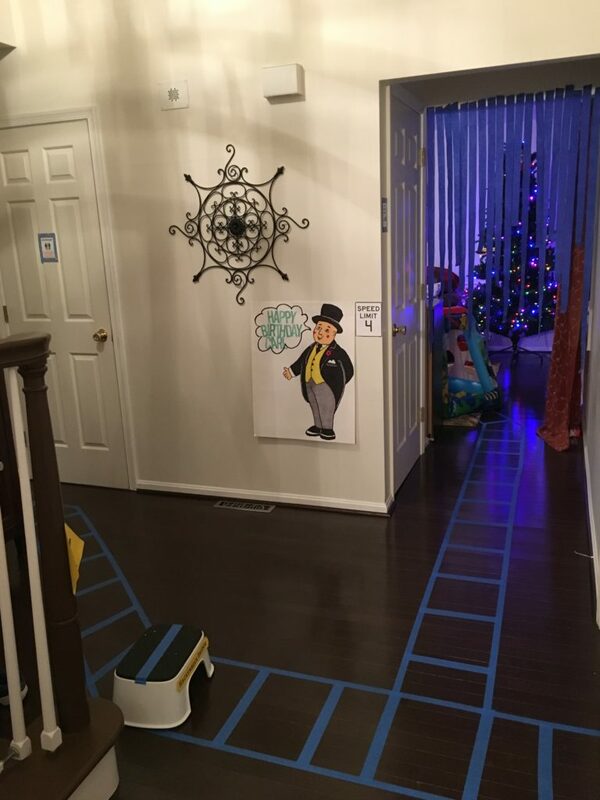 If you already have painters tape laying around (even if it’s all one size), that will work. I used the thicker roll to create “rails” throughout our first floor. Then I used the thinner roll to create the ties. Outside of our house, I used chalk to create tracks on the sidewalk. Next, I added in some printed signs for things such as Railroad crossing, speed limit, etc. I will share those with you on Saturday. I am not going to lie, these things take some work. If you are short on time, opt for something simpler like the aprons. Despite the length of time these took, I loved them. I thought they added an extra special element to the party. Plus, it provided the kids with an instant activity. 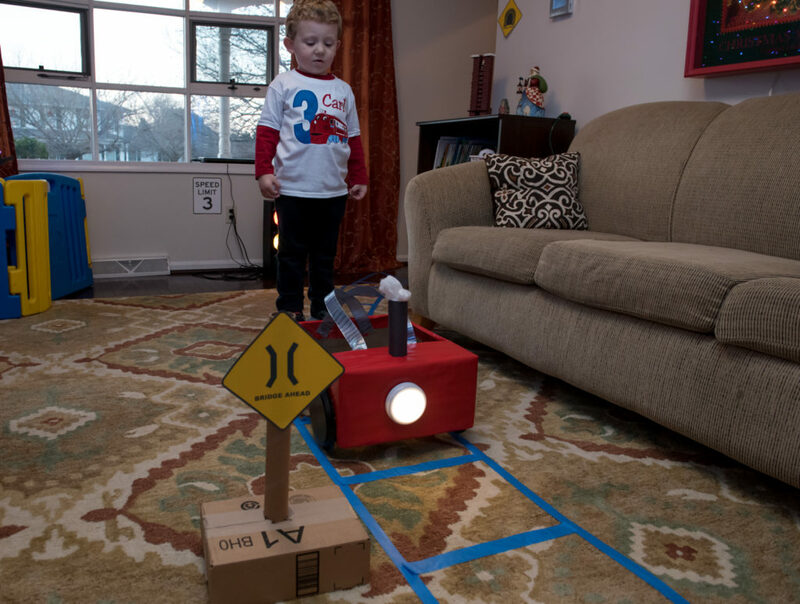 I loved watching their imaginations soar as they pretended to be trains running on the tracks. The funny thing is, our birthday boy was nervous about wearing it during the actual party. He loved watching everyone else pretend to be trains. What to know how to make the train cars? Click here! 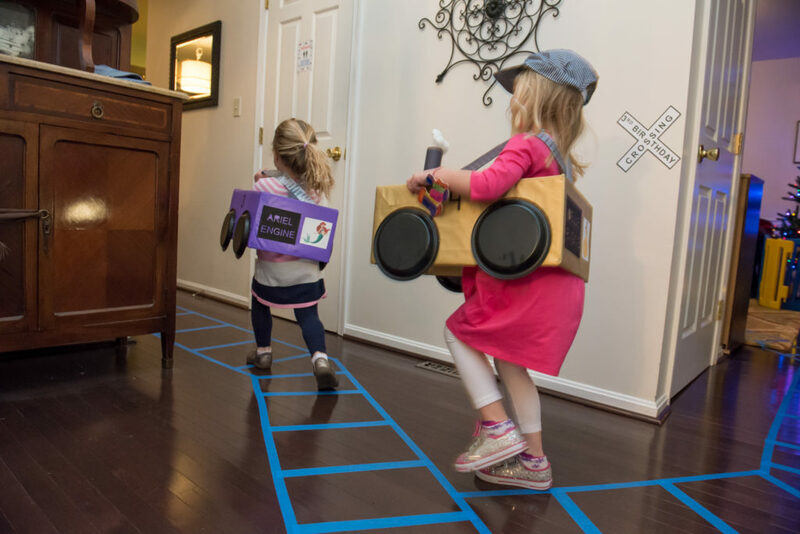 This is a much easier way to make the kids into trains. I used these aprons from Amazon. I found some of the Thomas character’s faces online and printed them on printable HTV (I prefer Jet-Pro and I got it from Amazon). Then I used my Silhouette to cut them out and press them with my heat press (VERY low temp for only a few seconds). Now, if you don’t have a Silhouette you should get one, you have two options. 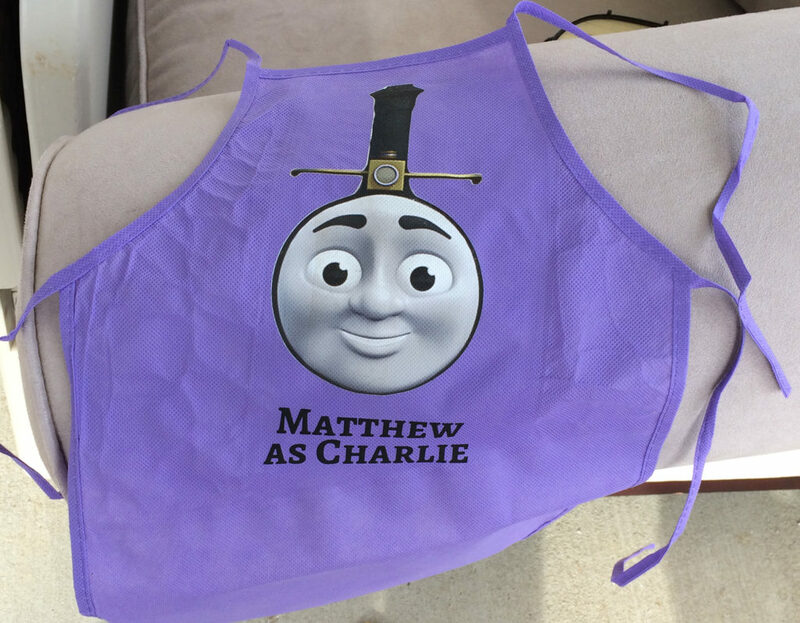 One, you can print out the picture, cut it out and glue it onto the apron. I would suggest printing it on card stock. Your other option is to use Avery’s printable iron on. Use a very low temperature iron and press for only a few seconds at a time until it adheres. You could also use shirts instead but the aprons went with our train decorating activity later (and they were a LOT cheaper/didn’t need to worry about the size!) Here is a finished apron example. I had a harder time finding train ornaments so I made my own. I bought wooden train cutouts and then used hot glue to glue on a ribbon loop so it could hang. 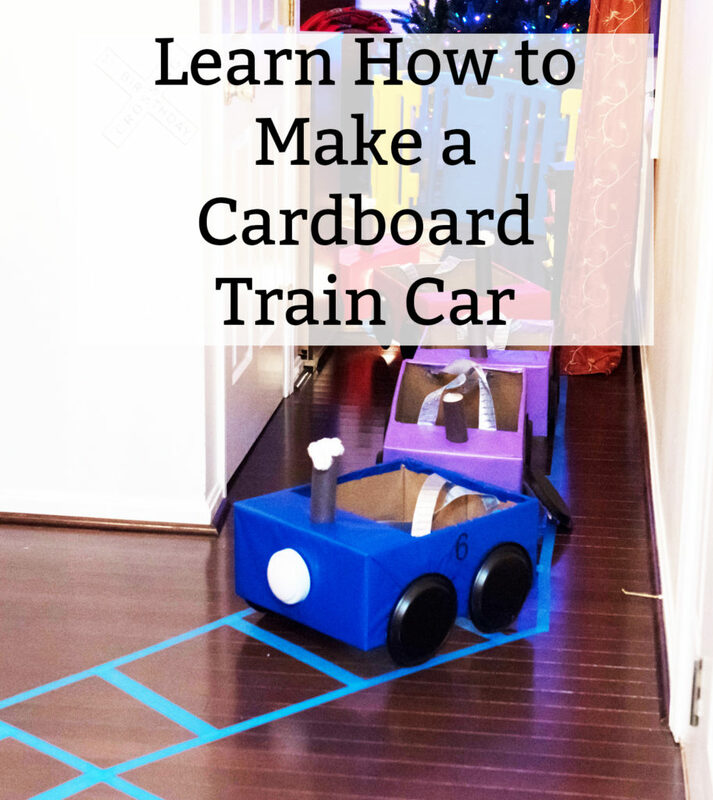 To save more money, you could make it using a train cut out of cardstock instead. I had to special order these because the Michaels closest to me were out of them. Where I ordered them from no longer has them available but this option on ETSY would be great. I purchased this Rice Krispie Treat train mold while grocery shopping one day. Carl asked to do it at his party and I thought it would be the perfect activity. I was able to make a couple of batches of rice krispies pretty quick (including some vegetarian ones – special marshmallows) with the boys. Then I purchased packs of 3 metal carryout containers from the Dollar Store to package their rice krispie treat (that way they could work on it and then just close it up and take it home after. I was SO glad I did this. It also kept everyone’s straight because their name was on the container). I made royal icing and placed it inside of small clear squirt bottles (using a coupon a couple of different occasions to buy them from Michael’s). Then I gave each child a cup full of sprinkles and various candies. To save money, I bought a bag of various candies after Halloween on sale (I made sure they would be good for the party). Each child had a Popsicle stick to help spread the frosting. The kids LOVED this activity. My Mom printed off a bunch of train-related coloring pages for me. I set them up at a table with some crayons so that I had a go-to activity during any down time. This worked out so well the first year, we did it again the second year. 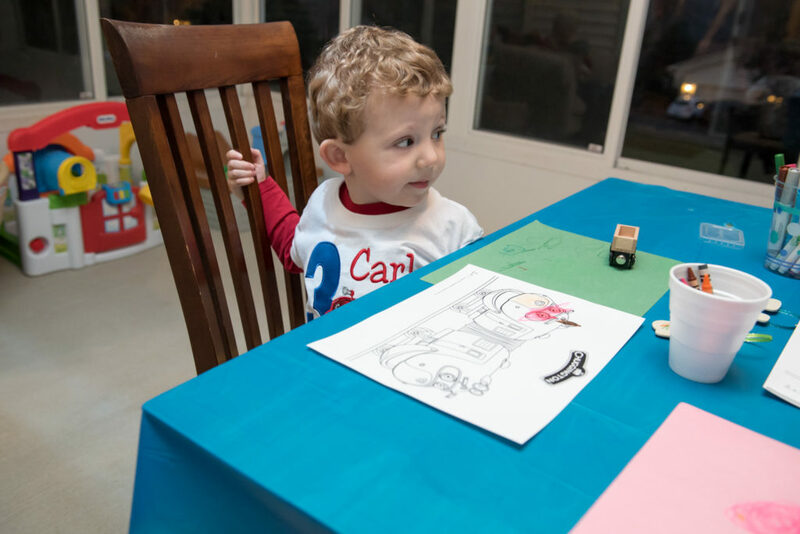 I made sure to find some images on Google that had trains and also other characters (like Peppa the Pig) so that all of the kids would enjoy coloring the pages. If you want a completely free and FUN game, do Conductor Says. It’s run just like Simon Says, only you use the term Conductor. My husband ran this while I set up dinner. It worked perfectly. He actually let the kids take turns being conductor as well. Because the kids are younger, we opted not to have kids sit out if they didn’t listen to the conductor. The first year, I used two table cloths from the dollar store to make the sky and grass. Then I used my Silhouette to cut out train tracks which I glued on. Then I cut out trains. 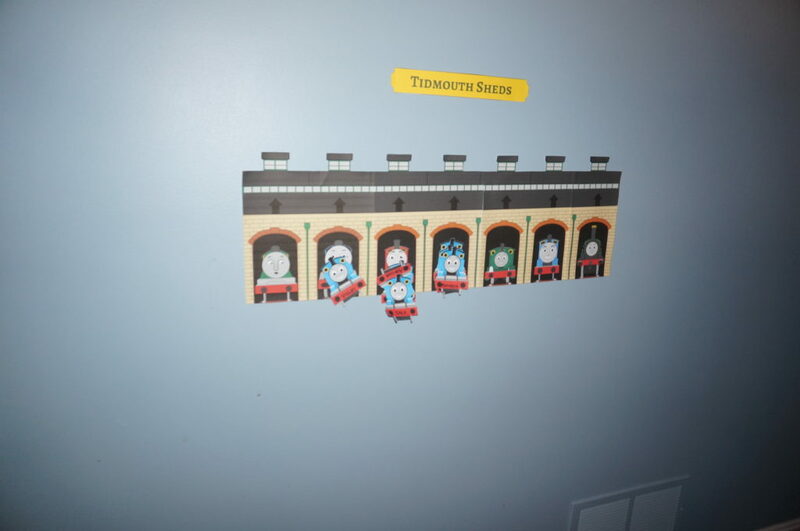 The year after, I found this amazing FREE printable Pin the Thomas in his Berth game during my Google Search. Carl saw this game when I was scrolling through Pinterest and wanted to play it despite it’s similarity to the coal in the hole. This is great for people without as much room. My wonderful husband, again, crafted this game. 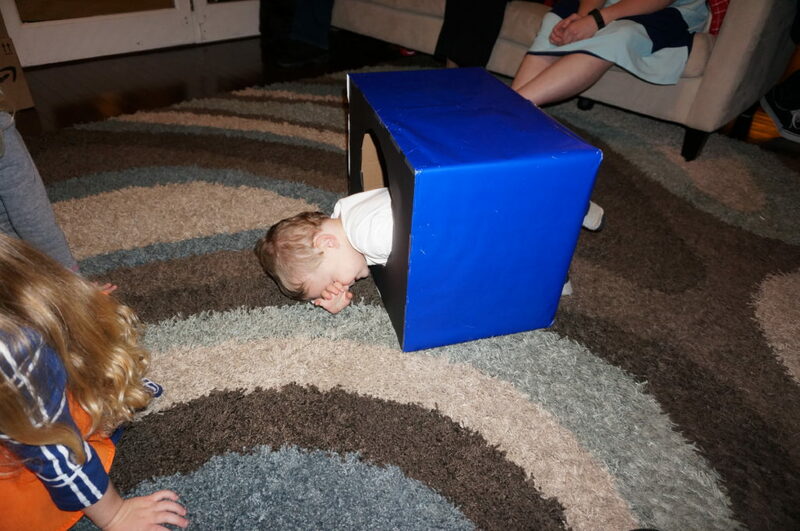 He took a smaller box that was the shape of a train car. Then he cut a hole in the top and covered in with craft paper. I cut out train wheels with my silhouette for him to add on the front. Unfortunately, I don’t have a picture of it before Jack destroyed it. He spent the gift opening climbing in and out of the tinder car. Okay, this isn’t train-related at all. But I had to share my favorite birthday tradition. Growing up, my parents always created a treasure hunt. Our parties became known for them. The end prize was our goody bags. My husband agreed to let me do the same thing with my kids. It was definitely a fun way to end the evening! Wow, y’all really went all out! 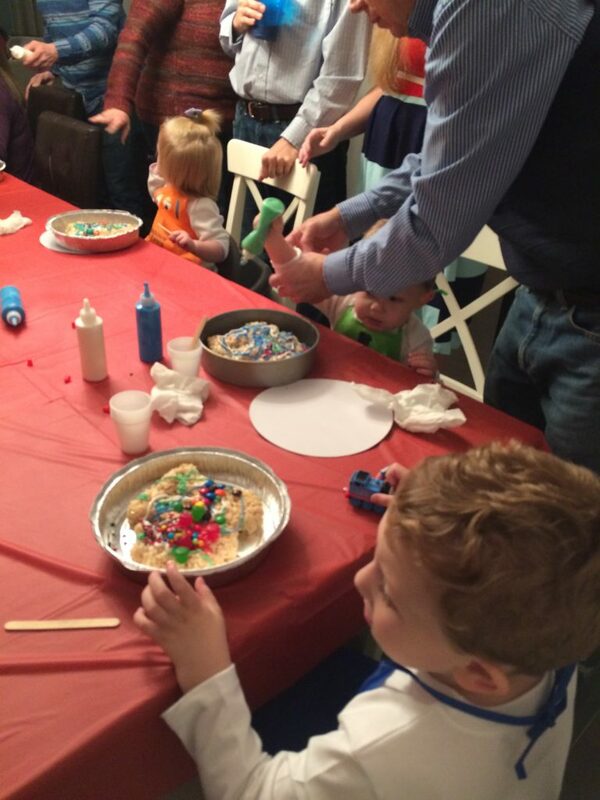 Looks like the kiddos had a blast! I bet I would have too. ? 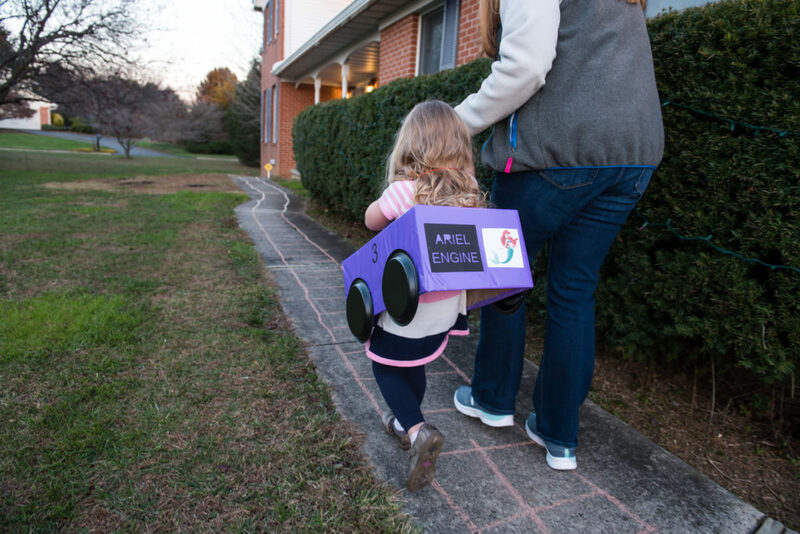 This is awesome, wishing I had something similar when I was young! I used to play egg and spoon race, tug of war, water balloon fights, but never had a theme. Will definitely save this tab for my son’s next party.